A despairing father is torn between love for his family and duty to a corrupt city in Verdi’s searing early tragedy starring Placido Domingo conducted by Antonio Pappano. Jacopo Foscari, son of the Doge of Venice, is convicted of murder and treason. His wife Lucrezia is sure of his innocence. But the Doge, trapped by the machinations of a corrupt city, is forced to make a terrible decision. The Doge is presented with a deathbed confession that confirms Jacopo's innocence; that moment, a horrified Lucrezia brings news of Jacopo's death. The Council of Ten demands the Doge's resignation. As the bells of St Mark’s sound, he falls lifeless to the ground. 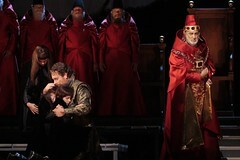 I due Foscari, Verdi's sixth opera, is one of his darkest and saddest. At its heart is a father's realization that there is nothing he can do to protect his family against the world's cruelties. The 31-year-old composer may well have drawn on his own devastating experience of losing his wife and two infant children a few years earlier. But despite the opera's sombre soul, the music for I due Foscari contains exhilarating forerunners of Verdi's later style – particularly in the fiercely virtuosic writing for the heroine Lucrezia and her magnificent duets with the Doge in Act I and with her doomed husband in Act II. 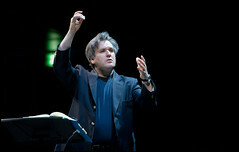 American director Thaddeus Strassberger, making his Royal Opera debut, depicts a Venice that is rotten to its core. Mattie Ullrich's opulent costume designs reference the opera’s 15th-century setting while suggesting the corruption lurking beneath. The spare sets of award-winning British designer Kevin Knight illustrate the Foscaris' isolation and the decay of the city, before flaring out into grand guignol for the opera's brilliant Act III carnival. The Music Director of The Royal Opera on opera in cinemas, the pressure on singers, and his thoughts on concept-led 'Regietheater'. To find out more visit the I due Foscari (2014) production page.